Sand and Water. Summer doesn't get any more iconic than that! 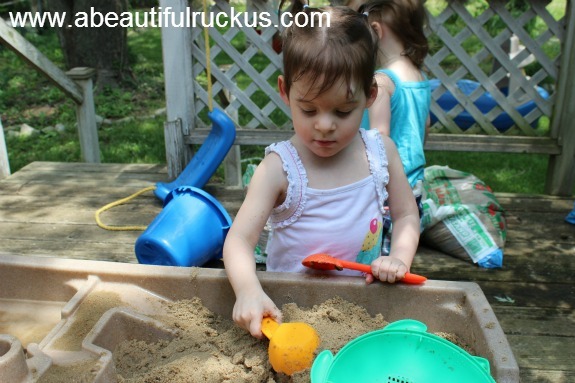 A couple of weeks ago, we found the perfect day to head outside and discover all of the fun things we could do with our Sand and Water Table! We were blessed to have it passed on to us by the Barrs when they moved to Alaska early in the spring. To break it in, we invited Rachel and her mom Sarah over to help us with some fun sensory activities, and decided that it might be fun to share them with you as well! 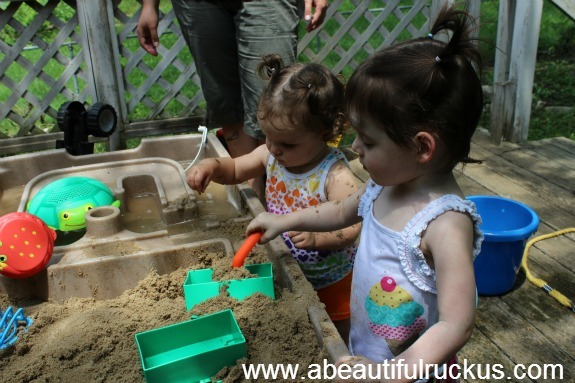 What is a Sand and Water Table? It's exactly what it sounds like. It's a child-size table that is divided in half. One half contains sand; the other half contains water. Where did you get the awesome toys in the photos? Glad you asked! The toys in the photos are from the Melissa and Doug Company. They make some of my very favorite kid toys that are super durable and can stand up to lots and lots and lots of playing! We have the Seaside Sidekicks Sand Baking Set, Seaside Sidekicks Brick Building Sand Toy, Clicker Crab Hourglass Sifter and Funnel, and the Finney Fish Spray Bottle x 4! 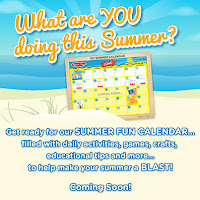 Additionally, this post is part of the Melissa and Doug Summer Fun Calendar! Make sure you click the icon below to follow along with great ideas to make your summer a blast! The first things the kids discovered was the texture of the sand. They would grasp it and then let it fall back through their fingers. It didn't take long before they started experimenting with taking a fistful of sand, putting it in the water, and then pulling mud back out. It's like magic! Our friend, Rachel, was a pro at this activity, and yet somehow managed to stay the cleanest of her little friends. The wisk in this photo is from the Seaside Sidekicks Sand Baking Set. Meanwhile, on the other side of the table, Abby was going to town with the splashing. She thoroughly enjoyed splashing everyone around her and feeling the water droplets hit her face. Why did I take a shower that morning? 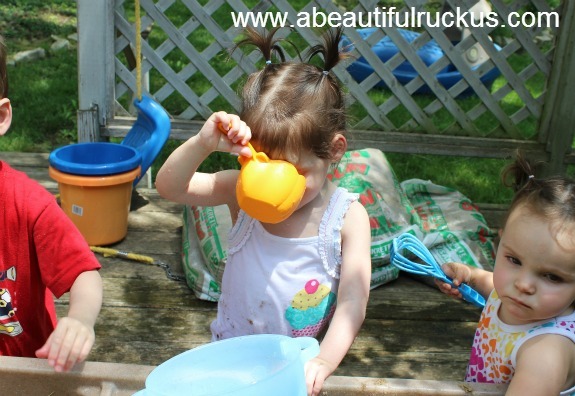 Smacking the water with objects makes a bigger splash than if we just use our hands! Ellie quickly found the measuring cups in our stash of toys, and alternated between scooping up the sand, then dumping it back out, and scooping up water, then...drinking it. As a side note, I washed the table before we started, so everything was clean. Besides, I didn't want to ruin what she was doing. By scooping and dumping from both sides of the table, she was feeling different weights and watching the materials leave the measuring cup at different speeds. A lot of education is worth a little dirt! I'm really glad that we got this funnel! It is awesome because the kids could watch either the sand or water fall through it. The sand goes very slow, but the water falls very fast. 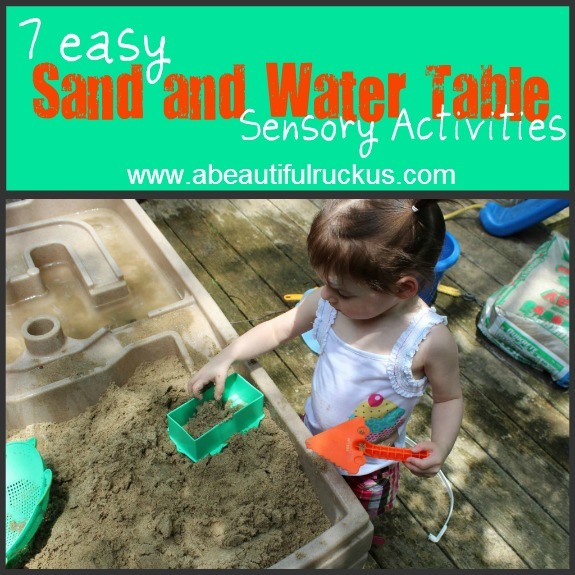 The kids could also hear the difference between what it sounds like as the sand hits the table, and what it sounds like when the water does the same thing. Elijah thought is was really interesting to play with. Our big mixing bowl has a sifter on top. 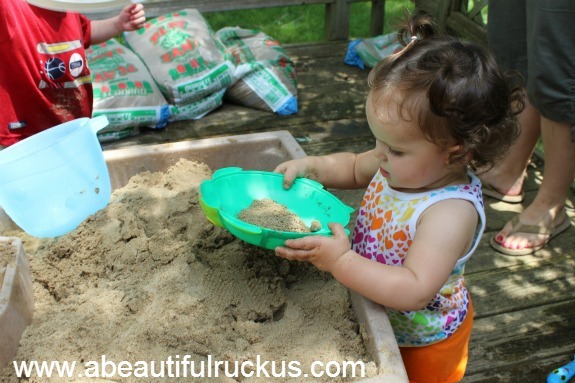 This was such a great toy to use on the sand side, because we could bury toys in the sand and then shake it back and forth until we found them again. It's like a mini-treasure hunt! I also appreciated that it required a different movement than scooping and dumping. It had rained the night before, and that made for some perfect packing sand. We have these great little brick sets that come with the brick mold and trowel. Ellie did an awesome job learning how to pack sand into the mold until it was full, and then turning it out to make a brick. Of course, it didn't last long as she learned how to build and destroy with her brick maker. Just consider this a bonus activity! I wish I could claim coming up with this one, but Caleb is the creative mind behind it. To fully absorb the sensory experience, you can also eat the sand. In case you were curious, it's really crunchy. 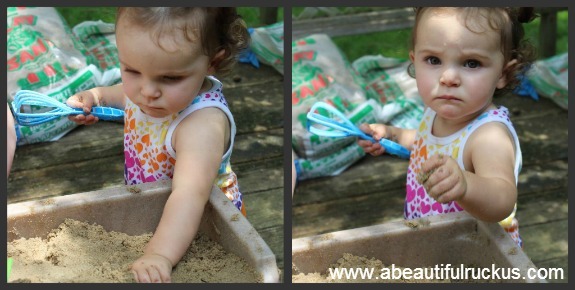 It's true that Sand and Water Table activities can be messy (next time everyone will be wearing swimsuits so that I can spray them down afterwards), but all of the textures, sounds, and movement associated with those elements make it a very fun, and educational way to spend the afternoon! Many thanks for Melissa and Doug for providing the toys in this post! This post may contain affiliate links. For more info, please see my disclaimer page.This post may contain affiliate links. I LOVE M&D! I only buy their products when shopping for my niece and nephew. Some of their products, like the wooden ones, are SUPERIOR quality. Some of the plastic ones are a little lacking (chalkboard/whiteboard easel), but they have great customer service and will always replace things that are broken. Works for me! They really are a quality company! I know their products will be around for my grandkids! 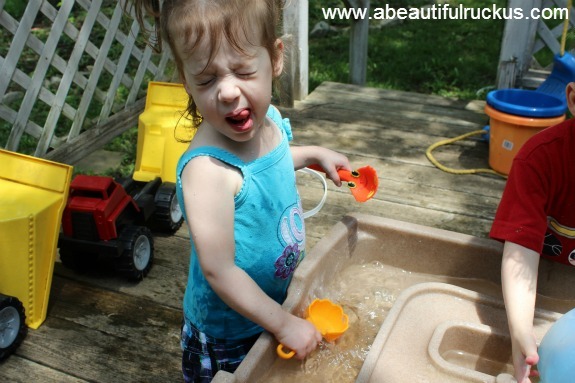 I need a new sand/water table. Ours got ruined from being out in the weather. Looks like everyone had fun! They are super fun! Definitely worth replacing! LOVE IT! I have always used and loved M&D items ;) glad you are having such fun with them as well! The Melissa and Doug company is my go to for toys! Oh I love the funnel! Me too! It's unique, so it lets them experience other things. Looks like a lot of fun! 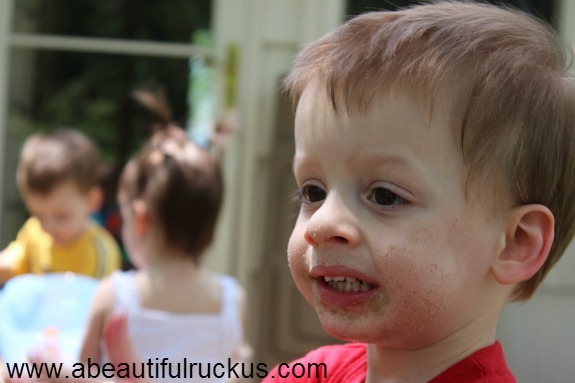 My son has a water table, and a big sandbox, but not one together. Those toys look great! I didn't know M&D made toys like that. I may have to go buy some for Nick to play with. I would definitely recommend getting a table with both sides and the Melissa and Doug toys to go with it. There is a lot they can do with all of those items! This looks so fun!! My son loves all his M&D toys! He's 18 months now, and we're visiting my parents at the beach. I think we'll have to get some of these toys when we get home because he'll miss the sand so much! Ooo...beach, fun! he will definitely need some toys when he gets back from that adventure! I didn't realized they had toys like that either! How fun! If you head to their website, they have lots of different categories organized by type of play, age, skill level, etc. I didn't know they made those kinds of toys either. How fun! Oh, I know! He's such a hoot! He didn't eat anymore sand after that. Lol! LOVE this!! TOTALLY SHARING ON TWITTER NOW! Thanks for sharing on Twitter, Heather! Aw!! Love seeing photos! So glad they are enjoying it! They are! Thank you so much for passing the table on to us when you moved! Hmm...I haven't had a chance to play with any of their kitchen food yet. Maybe that will be next on our list! Great ideas! 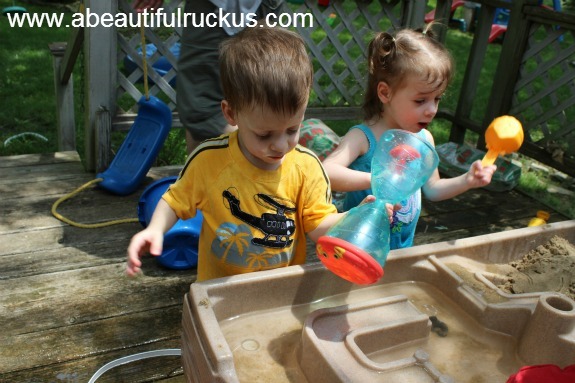 My sons love their water table. I hope you can use these ideas with your own kids. There is so much you can do with these tables and toys! It looks like the kids are getting so much out of these great activities. I love sensory tables and activities. Thanks for sharing. I'm dropping by today from the Harvest of Friends hop. Hope you can visit too. Thanks for visiting! Yes, I love activities that are educational and fun at the same time!